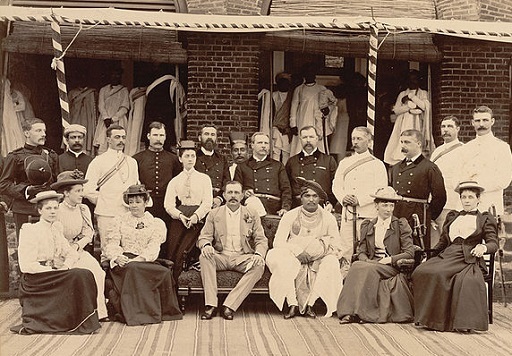 Photograph of the 19-year old Maharajah of Kohlapur visiting the British residency in his state, 1894. He is shown here with the Resident and his staff. British residents had ruled the state from 1884, when the Maharaja ascended the throne. British Library photo in the public domain. This is the story of the Rev. George Henry Ferris (1853-1894) and his wife, Lucy Hall Ferris (1854-?). The Rev is the great-great-great-great-great-great-grandson of Jeffrey Ferris through his son, James. Like his fifth cousin, once removed, Dr. Phoebe Annie Ferris, he was called to minister in India. This Ferris was born amid a cluster of Ferris kin in Hillsdale County, MI, in 1853. He married Lucy July 2, 1878. Ferris attended Princeton College and graduated in 1874. He went on the Auburn Theological Seminary and graduated in 1878. In 1879 he and his wife arrived in India where he would serve for the rest of his life. After the 1880 rainy season, the couple was sent to the Presbyterian mission at Panhala. The community, today, is 18 km northwest of Kolhapur, in Kolhapur district in the Indian state of Maharashtra. Ferris’s biography is found on page 99 of the above book. During their sixteen years of service to the mission at Panhala, about 300 miles southeast of Bombay, Rev. and Mrs. Ferris learned Marathi, an Indo-Aryan language of the Marathi people of western India. They translated leaflets, tracts and portions of the Bible into that language. On only one occasion did the Ferrises return to the United States for a visit. “The distance from home and the dangers to which she had been exposed in a land so full of injurious climatic influences, noxious reptiles and beasts of prey, made her return in the summer of 1889, with her husband and four children [Chauncy, Ralph, Herbert and Phoebe Ruth], born in India, all in safety and good health, an event of sufficient importance in the family to be celebrated in some special manner,” according to a printed remembrance of the event. Lucy Hall Ferris with Phoebe Ruth. My mother Ruth Ferris was Ralph’s only daughter.